Would you like to win a membership to The Sales Authority Club, valued at $8,364? Well guess what? You could! There’s no denying that right now is a great time to be a member/client/partner with us! 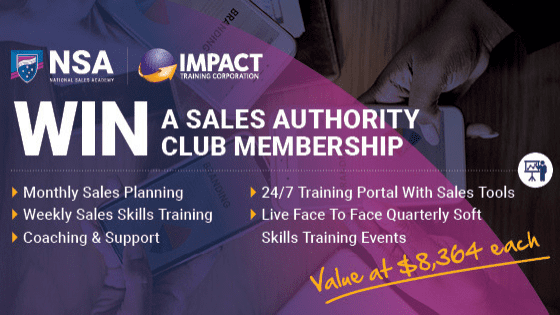 Because as a friend of Impact Training and the National Sales Academy we can invite YOU to enter to win an annual membership with our exclusive Sales Authority Club – which is valued at a cool $8,364! smash your sales targets time and time again! And the amazing news is Steve Jensen (the founder and facilitator of the Sales Authority Club) has assured us that one person from within our network will win the 1-year membership. attending the quarterly face-to-face workshops. In other words, if you follow the recommendations provided by the Sales Authority Club, you will increase your sales and take your business to new levels of success. But it only works if you are truly committed to the requirements of the Club. So the bottom line is: if you are NOT serious about wanting to make the changes to your business that are required in order to make more sales and reduce your frustrations, then DO NOT enter this competition. So. Have you stopped reading now? Or are you doubly pumped to get into the entry form! It’s okay if you’re not ready to make the commitment that Steve and his team need from their Club members; it might simply not be your time yet. But, if the above information excites you, then point your mouse to the ENTER NOW button and get your entry in today! Remember one person will WIN a 1-year membership to the Sales Authority Club. What are you waiting for?